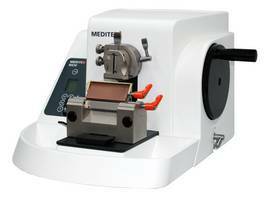 The motorized precision feed system of the Microtome M530 enables a fast, safe and smooth sectioning of paraffin blocks. A torsion-free solid base design secures optimum stability. The spaciously designed and integrated section waste tray is xylene-resistent and easy to clean. Quick release system for all clamping types. Download the brochure of our Rotary Microtomes here. If you are interested in this product and wish to receive further information, contact us via contact form or send us an email to info@medite.de. We're glad to advise you.